Let’s face it… November is a tricky month for outdoor activities. 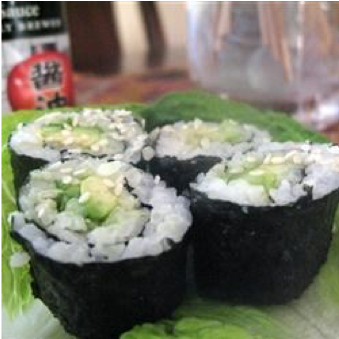 Sushi Rolls are not only fun to make, they make a fabulously nutritious lunch or snack. In a small bowl, combine the rice vinegar, oil, sugar and salt. Mix until the sugar dissolves. Stir into the cooked rice. When you pour this into the rice it will seem very wet. Keep stirring and the rice will dry as it cools. Center one sheet nori on a bamboo sushi mat. Wet your hands. Using your hands, spread a thin layer of rice on the sheet of nori, and press into a thin layer. Arrange 1/4 of the cucumber, avocado, and carrot in a line down the center of the rice. Lift the end of the mat, and gently roll it over the ingredients, pressing gently. Roll it forward to make a complete roll. Repeat with remaining ingredients. Cut each roll into 4 to 6 slices using a wet, sharp knife. Enjoy with soy sauce and wasabi too if you dare! Catch COOKSMART on Global TV Morning Show at 7:20 on December 4th! Check out the Santa Pancake Breakfast on Dec 8 at Manor Road United Church in Toronto – Kids can make their own pancakes and support the Theresa Group, supporting families who live with HIV. Our tasty soup jars will be available!